Seller can update bulk productsat a time. Seller can use.xls or.xlsx files, to update bulk products. The seller can view changes in updated products in the frontend instantly. Seller can update product in multiple language. 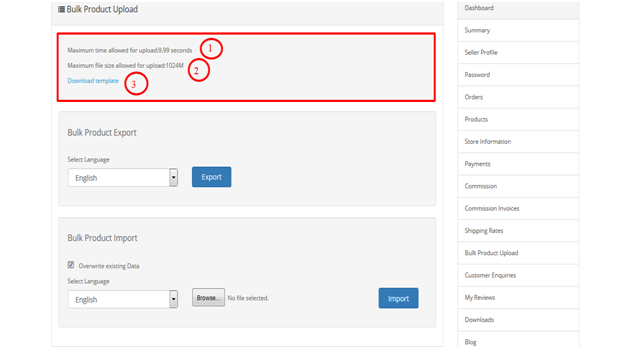 Login to your seller dashboard.Locate the seller panel. Click on bulk product upload. Maximum upload time come from php server. It must be more if file size is bigger to allow upload to complete successfully. Maximum file size must allow less thanphp server size limit for update product. Click on Download template link. If you need to update product then you can download sample excel data file. Seller should use exported data sheet for update product. If you want to change the data of any tab, then you have to fill the product id in the data and General tab and“new product“columnwill leave empty. If you do not know product_id then you can export data sheet with product_id and use it. First we will fill the valid product id in product_id column. We can not leave empty product_id column of General tab even for new product. This filed must be filled if inserting new product use any assumed product id in this field. First we will fill the valid product id in product_id column. We can not leave empty product_id column of Data tab.If any validation failed for any particular product id in this tab, no data will be updated for any of the tabs for that particular product id. For Example: How to update product price? Frist seller should use export data sheet and change price on excel data sheet. Check on Overwrite existing Data and select language after that click on import button. A product can keep one or more images so it can not leave empty product_image_id and product_id column.If you do not know product_image_id and product_id then you can export data and use it. Seller canupdate any existing image use exported data. If you want to update discount any existing discount use exported data. To update any product data enter product_discount_id and product id. Seller can not update product without product_discount_id and product_id. If you want to updateproduct any existing specialuse exported data. To update any product data enter product_special_id and product id. Seller can not update product without product_special_id and product_id. Overwrite existing Data must check for update product.You can choose select multiple language for update product.Next click “Browse” to upload a single excel data file, navigate to the needed folder on your computer and select the file you want to upload. file must be upload only in excel data sheet which is accept only .xls or .xlsx extension after that Click on import button to update product.